Pulsar Period Derivative & Pulsar "Characteristic Age"
Pulsars are rotating neutron stars that generate regular electromagnetic (EM) pulses at their spin rate. They were first discovered in the radio region of the EM spectrum by Jocelyn Bell and Anthony Hewish in 1967 . Since this pioneering discovery, pulsars have also been detected in other regions of the EM spectrum such as the optical, x-ray and gamma ray regions. This study will seek to detect pulsars from RXTE  x-ray observations, determine their intrinsic properties such as spin period, spin rate and period derivative1. Using this information we will attempt to derive pulsar properties such as ‘characteristic age’, magnetic field strength, energy loss rate and contrast results with the ATNF  pulsar catalogue and published research in addition to performing a pulsar analysis. We’ll conclude with a summary of key points. The following will provide background theory on supernovae, neutron stars and pulsars accompanied by information relating to the data source used for this study, namely the Rossi X-ray Timing Explorer (RXTE). endpoints of stellar evolution, the other two being white dwarfs (formed by stars with masses less than 8 solar masses) and black holes (formed by stars with masses greater than 15-20 solar masses). 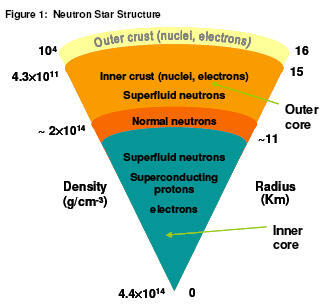 Figure 1 shows a theoretical neutron star structure and composition. During stellar nuclear fusion processes governed by gravity and pressure leading to a supernova explosion, the Chandrasekhar mass limit  is reached whereby electron degeneracy pressure at the stellar core can no longer support a gravitationally collapsing star. At this point of extreme density, relativistic electrons combine with protons in and around the stellar core via a process called neutronization (also known as inverse beta decay) resulting in neutrons and electron neutrinos being created i.e. e-+ p to n + v_e. During neutronization many protons are converted to neutrons and vast amounts of neutrino energy is released. Neutron degeneracy pressure  in a similar way as electron degeneracy pressure halts further core collapse. A neutron star is created at this point; also described as a supernova by-product or stellar corpse. The supernova is powered by neutrino energy released from inverse beta decay and by explosive fission nucleosynthesis processes around the neutron star as part of the SNR2. The newly created neutron star is extremely small, highly magnetised (magnetic field approximately 10^12 Gauss) and fast spinning (spin period is generally between 0.25 and 2 seconds)  compared to its pre-supernova stellar progenitor. The neutron star may also be ejected from the SNR due to explosion asymmetries resulting from the supernova. Rotationally-powered pulsars emit electromagnetic radiation from their magnetic poles (shown in blue in figure 2) resulting from their inherent rotation energy. The electromagnetic dipole radiation emitted can be across a large portion of the EM spectrum, generally from the x-ray region down to the radio region. Typically the radiation is seen in the radio region of the EM spectrum. Accretion-powered pulsars emit electromagnetic radiation via magnetic dipole radiation as well as by collecting material on their accretion disk typically from a binary companion in close proximity, or even by their closely associated SNR. Disk accretion creates x-ray ‘hot-spots’ which are responsible for periodic intensity variations (and non-periodic intensity variations) in these pulsars. Magnetars are thought to be the sources of Soft Gamma ray Repeaters (SGR’s) and Anomalous X-ray Pulsars (AXP’s) . Magnetars are highly magnetised neutron stars in fact much more than conventional neutron stars by a factor of up to 100 or more, with magnetic fields in the order of 10^14 Gauss and capable of emitting both x-rays and gamma rays by decay of their very strong magnetic field. The very strong magnetic field of a magnetar is thought to be inherited when the neutron star is first created during a supernovae . The Ross X-ray Timing Explorer (RXTE) is a NASA mission which was launched in December of 1995. Originally designed as 2 year mission with a maximum lifespan of 5 years, RXTE is still in service today (November 2005) collecting x-ray data from galactic sources such as pulsars, galaxies and binary star systems. RXTE carries three detection instruments two of which, PCA and HEXTE [10, 11] are ‘pointed’ instruments for point-source x-ray detection. The third instrument called ASM  is designed to perform x-ray detection at large angles across the sky. The Proportional Counter Array (PCA) instrument detects x-rays in the lower part of the x-ray energy spectrum (2-60 KeV), whilst the High Energy X-ray Timing Experiment (HEXTE) detects x-rays in the upper part of the x-ray energy spectrum (15-250 KeV). Both detectors are designed such that they are able to overlap a substantial portion of their respective EM spectrums. Both the PCA and ASM are proportional detectors  whilst HEXTE is a scintillation detector . Both PCA and HEXTE have been designed with microsecond time resolution capability i.e. the PCA instrument of our pulsar study is capable of detecting a range of pulsar periods down to 1 microsecond spin period accuracy. The EDS (Experiment Data System) onboard RXTE is responsible for capturing PCA pulsar data, processing it in ‘time binned mode’ , and inserting the results in the RXTE telemetry system for delivery to Earth based data collection systems. The PCA data used for our pulsar study relates to the detection of two young pulsars, namely PSR B0540-69 and PSR B1509-58. The former is associated with the LMC (Large Magellanic Cloud) at a distance from Earth of approximately 49.4 kpc and is associated with SNR 0540-693, whilst the latter is at a distance 4.4 kpc in the constellation Circinus as part of SNR G320.4-1.2 (shown on the cover page) . 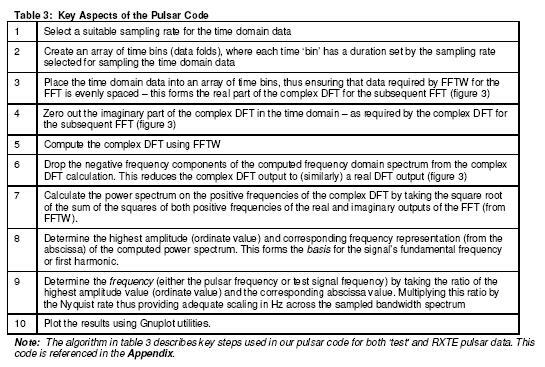 The following describes technology and techniques required to analyse RXTE pulsar data. The method behind the chosen approach for data analysis will be described along with relevant signal processing theory required to place the subsequent sections of this study into context. – i.e. takes a signal from a time representation to it’s frequency equivalent or conversely from the frequency ‘domain’ to the time domain using operations such as: 1) Signal decomposition – taking a real world signal e.g. pulsar signal and separating this into its corresponding sine and cosine components. 2) Signal processing – perform mathematical calculations on the corresponding sine and cosine components in a meaningful way for subsequent signal synthesis. 3) Signal synthesis -re-construct the signal to produce relevant results in the corresponding domain e.g. convert from the time domain to frequency domain, or vice-versa. One of the objectives of this study is to detect pulsations at given frequencies for each pulsar data set. To do so we create pulsar analysis code in the ANSI C programming language (table 2). We perform Fourier analysis of a pulsar’s time domain signal (RXTE data) provided as photon counts as a function of time. The use of a Fourier Transform -more specifically an optimised variant of the Discrete Fourier Transform4 called the Fast Fourier Transform (FFT) is used in our pulsar code on RXTE data. We typically fold or ‘bin’ the pulsar data at regular time intervals as a required preparatory step for the FFT operation. Using a DFT stems from requiring to capture a continuous signal from a real world system such as a pulsar and discretise it in it’s time domain digital equivalent (performed by the RXTE PCA and EDS systems). Having the digitised representation of a pulsar signal in a computer system allows us to perform signal decomposition, processing and synthesis to produce the required frequency domain equivalent. The DFT is arguably the only type of Fourier transform that may be used to operate on such representation of the real world given it’s ability to render a continuous and periodic pulsar signal into a discrete and periodic representation. Computer algorithms implementing FFT’s are very efficient. Generally the time taken to calculate a transform on a data set via an FFT algorithm is of the order N log2 N, where N is the number of data samples required to be a power of 2. DFT’s using methods other than FFT’s typically take much longer to compute, in the order of N^2. Note however that computational time comparisons are impacted by algorithm efficiencies, operating systems and hardware used or combination of these. Ignoring these aspects for the purpose of making a simple comparison between FFT’s and traditional DFT’s5 computations, FFT’s are faster -in the order of 100 times or more than traditional DFT methods i.e. compare O(N log2 N) versus O(N^2)  computations required to achieve a transformed result. making mathematical transformations6 easier to work with. frequency domain to the time domain. Zeroing the imaginary input data of the complex DFT in the time domain. complex DFT in the time domain. Discard the negative frequencies of both real and imaginary part in the frequency domain. Compute the power spectrum in the frequency domain of the remaining positive frequencies. Programmatically the FFT was implemented via the FFTW software library as indicated in table 2. Although FFTW does supports real DFT algorithms to perform a Fourier transform, we opted to perform a complex DFT via FFTW and reduce the transformed output to mimic the computation of a real DFT (as shown in figure 3). In doing so we avoided additional programming complexity in our pulsar code otherwise required for a real DFT i.e. avoided managing different size input and output arrays and array "padding" , resulting in simpler pulsar code. The sampling rate also known as the sampling frequency is defined as the number of samples per second (Hz) taken from a continuous time domain signal to convert this into a ‘proper’ discrete signal. The inverse of the sampling rate also known as the sampling time (or sampling period) sets the length of the time bins for data folding so as to prepare the data in an evenly spaced manner required for the FFT. The sampling rate is related also to the Nyquist rate as per the Nyquist-Shannon sampling theorem . It ensures that we evenly space the data (fold data) as prerequisite for the FFT operation performed on the time domain data in our pulsar code. 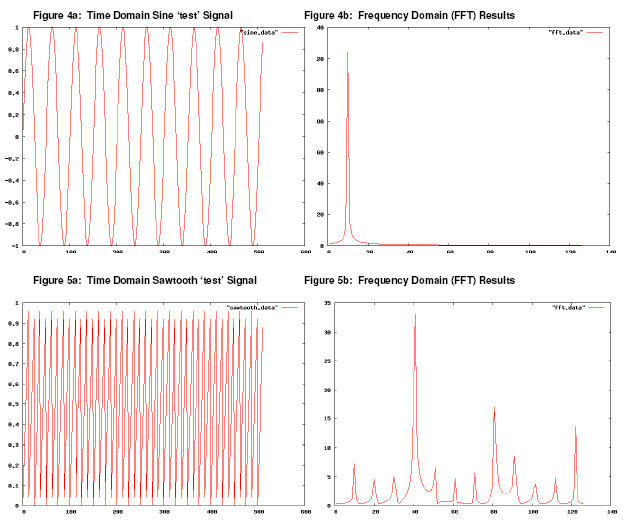 Knowing the value of the ‘test’ signal sine peaks in the frequency domain before the FFT. This assisted in understanding the likely Nyquist rate and sampling rate to use on time domain ‘test’ data. Understanding the likely characteristics of pulsar spin periods at ‘worst case’ scenarios e.g. millisecond pulsars which would require a very high sampling rate, hence determining the Nyquist rate and sampling rates required for RXTE pulsar data to be sampled and subsequently transformed into the frequency domain spectrum. One of the fundamental objectives of this study is to find the spin period and pulsar frequency from RXTE observations and use this result to derive other important pulsar properties such as period derivative, age, magnetic field and energy loss rate. Figure 4b shows a single peak with fundamental frequency 10Hz corresponding to the oscillations observed in the time domain. This provided adequate confidence and evidence that the algorithm to be applied to RXTE pulsar data was appropriate. As further confirmation before transforming RXTE pulsar data, a sawtooth function was transformed itself composed of a fundamental frequency accompanied by a number of overtones8 producing the FFT results in figure 5b. This further demonstrates the validity of the algorithm in table 3 as it clearly shows what is considered an appropriate FFT for a sawtooth function. The fundamental frequency occurs at 42Hz, the first overtone (2nd harmonic) at 84Hz, the second overtone (3rd harmonic) at 126 Hz. Both the sine and sawtooth functions contained 512 data points which were sampled at a rate producing 256 ‘time bins’ (samples or intervals) containing time domain data. This sampling rate used was high enough so as to avoid any possible aliasing effects. As a further test for both test signals (not shown) decreasing the sampling rate shifted both spectrums in the frequency domain to the right, implying the detected fundamental frequency and associated harmonics were moved closer to the Nyquist rate set by the sampling frequency chosen. produced the same results – thus proving no aliasing artefacts would interfere with the results. 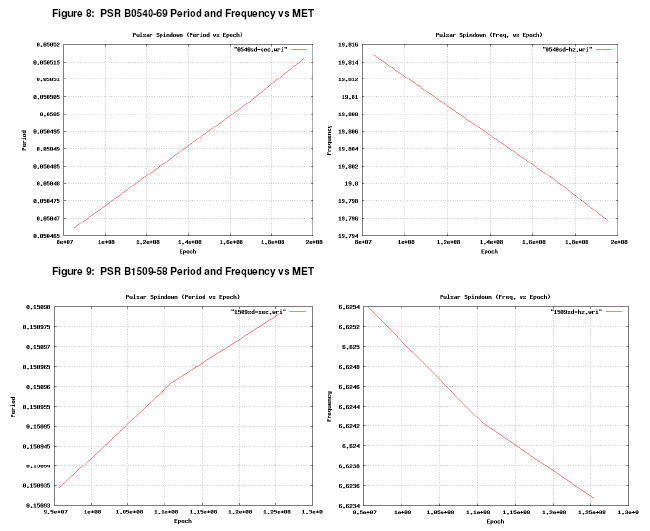 Sampling rates, sampling periods and corresponding Nyquist rates used for each pulsar (PSR B0540-69 and PSR B1509-58), where each had 3 data sets respectively are shown below9. The last 3 periods produced identical results and served as confirmation of appropriate choice of sampling rate(s) for RXTE data sets. Given the fastest spinning pulsar was found to have a spin rate below 20Hz (figure 7), a sampling period up to 0.05 seconds could have been employed and still satisfy the Nyquist-Shannon sampling criterion. where ‘dP’ is the change in pulsar period, ‘dt’ is the change in time related to dP (MET), and ‘P’ is the spin period of the pulsar in seconds. It should be noted that the ‘characteristic age’ calculation shown here assumes that pulsar spin period (and by consequence period derivative) is the key determinant for the ‘characteristic age’ calculation. 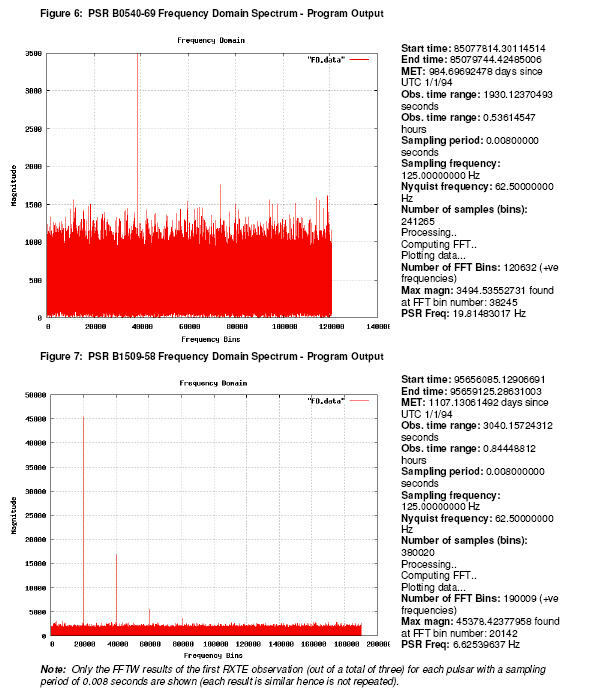 The frequency domain spectrum in figure 6 and 7 (PSR B0540-69 and PSR B150958 respectively) demonstrate PSR B1509-58 having multiple harmonics (at least 4) whereas PSR B0540-69 shows only 2 harmonics. A possible explanation may be the number of harmonics is related to the pulse width of the source i.e. the higher the number of harmonics the narrower the pulse frequency . In addition given PSR B1509-58 is much closer to Earth than PSR B1509-58, the intensity of the pulse emitted from the pulsar is likely to be stronger and not as dispersed (hence narrower) than PSR 0540-69. Possible confirmation appears from the ordinate value in the amplitude power spectrum of both pulsars in figure 6 and 7 indicating a much higher amplitude value for the fundamental frequency and associated harmonics of PSR 1509-58 compared with PSR B0540-69. Pulsar spin periods increased (accompanied by frequency decreases) in line with observations taken at different times as shown in figure 8 and 9. These results are an expected consequence of pulsar spin-down as energy from magnetic dipole radiation is emanated from the pulsars. It’s possible that the energy emanated from both these pulsars interacts via non-thermal processes with the respective SNR each pulsar is associated with [26, 27]. Pulsar spin down may be associated with accretion torques retarding a pulsar’s spin period (where an accretion disk may be present around a pulsar typically via presence of a binary companion) or more commonly from rotational energy losses causing magnetic dipole radiation as describe in the introduction . Typically a braking index is associated with pulsars which is a measure of the slope of a spin down curve where the rotation speed of a pulsar is plotted as a function of time. The braking index can be used to show how close a pulsar is to fitting the rotational model commonly associated with energy losses via magnetic dipole radiation. A braking index equal to 3 conforms to a model rotationally powered pulsar where all energy is radiated away via magnetic dipole radiation. A combination of all or some of the above may contribute to the energy loss rate of this pulsar [21, 29]. Analysis of the ATNF Pulsar Database revealed that neither of the two pulsars, each being part of a SNR is part of a known binary system. 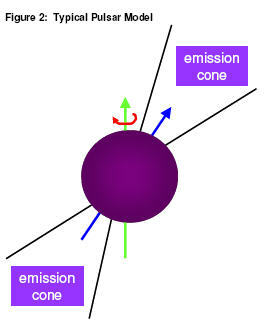 Although there is divergence in braking indices as indicated earlier, calculations in the "Results & Commentary" section assumed both pulsars to be model rotational pulsars implying a braking index of 3 for each, thus assuming magnetic dipole radiation as being the only energy source emanating from each pulsar. This simplistic presumption allowed calculations relating age, magnetic field and energy generation (energy loss) rates to be made simply based on the pulsar period and corresponding period derivative. The epochs at which the observations where taken from RXTE compared with other sources. At various points in time as shown intrinsically by the RXTE results, there are changes in pulse frequency and spin period due to pulsar spin down, hence when we compare the year in RXTE observations were taken (between 1996 and 1998) with other sources such as ATNF (1984) and literature (various years before 1994) we find our calculated values for spin period and pulsar frequency respectively higher and lower than catalogue and literature values, consistent with measurements being performed at a later epoch by RXTE. Both pulsars may have also suffered glitches  between observations which typically spin-up pulsars causing the spin period to decrease (spin rate to increase) which would affect the period derivative also. Non-rotational processes described earlier involved in energy generation are also not accounted for in the ‘characteristic age’ approach which relies on pulsar spin period to determine pulsar age. Hence the ‘characteristic age’ approach described in this study should not be considered entirely fool proof. There is in fact evidence indicating that the ‘characteristic age’ method may not be entirely accurate given different estimates of pulsar ages put forward by pulsar observations of various research groups. In order to confirm pulsar age estimates based on the ‘characteristic age’ approach, other techniques may be required such as radial velocity measurements in conjunction with proper motion measurements of a pulsar and it’s associated SNR  if these can be reasonably made. Given the above relations for magnetic field and energy loss rate of a pulsar and table 10 analysis, the spin period appears to be the key determinant in both pulsar’s magnetic field and energy loss rate i.e. the spin period is directly proportional to the magnetic field and inversely proportional to the energy loss rate as shown in table 10. In addition one can see that faster spinning pulsars (small spin period) lose energy more quickly than their counterparts (slower spinning pulsars with larger spin periods). This is analogous to the behaviour observed by a ‘spinning top’ which loses a large amount of kinetic energy early in it’s life before gradually spinning down via surface friction. Consequently as a pulsar ages and spins down its ability to lose energy via magnetic dipole radiation is typically reduced. 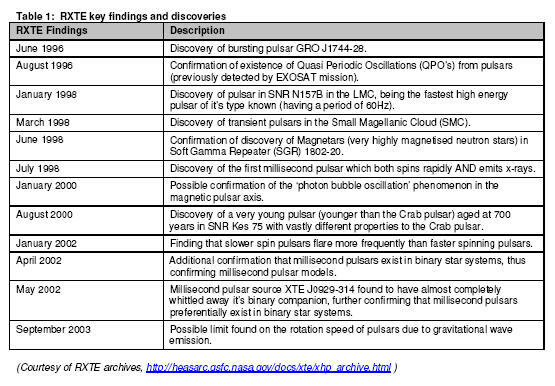 Table 10 suggests also that if indeed PSR B1509-58 began life as a fast spinning pulsar (it has a larger spin period than it counterpart PSR B0540-69) in line with the accepted pulsar model whereby the spin period starts small and increases over time, it cannot be excluded that its magnetic field may have been in the high order of 10^13 Gauss or higher at ‘birth’. If this was the case in it’s early past, PSR B1509-58 may have been a very highly magnetised neutron star capable of emitting EM energy well into the x-ray region. We exclude the possibility that PSR B1509-58 may have been a magnetar based purely on characteristic age results (Magnetar models suggest ages of up to 10^4 years from birth) . Both pulsars have moderately high period derivatives and (with the exception of millisecond pulsars) and are reasonably fast spinning objects in line with their calculated ‘characteristic age’. 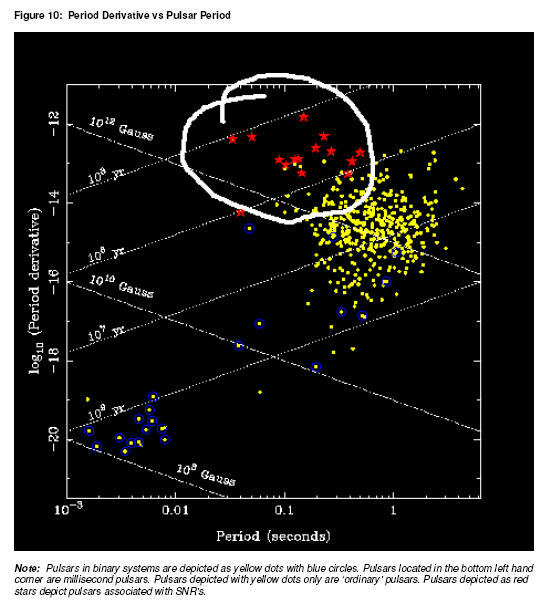 These observations place both PSR B0540-69 and PSR 1509-58 in the white circular region depicted in figure 10, in agreement with their SNR associations. The characteristics of two rotationally powered pulsars namely PSR B0540-69 and PSR 1509-58 were determined via data folding and Fourier analysis using a Fast Fourier Transform (FFT) to implemented a complex DFT. In sampling the time domain data, appropriate sampling rates were used on ‘test’ data and pulsar data so as to satisfy the Nyquist-Shannon sampling theorem and avoid potential aliasing effects in the sampled spectra. The ‘real’ data resulting from our pulsar code employing the FFT enabled subsequent calculations providing the spin period and corresponding period derivative for each pulsar. These pulsar baseline characteristics were then used to calculate individual pulsar ages using a ‘characteristic age’ approach as well as associated magnetic field strength and energy generation (energy loss) rates for each pulsar. Commentary and analysis of results indicated possible reasons for the differing harmonics and signal strength detected from each pulsar. Reasons were provided for the spin-down nature of pulsars such as accretion torques and rotational energy losses accompanied by a discussion on pulsar braking indices and how these indices related to the ‘characteristic age’ of pulsars. Discussions on discrepancies in calculated results for pulsar characteristics centred around the accuracy of the calculations and the epoch in which the data collection was performed. The pulsar ‘characteristic age’ model was critiqued and other methods of determining pulsar age were referenced such as proper motion measurements from SNR’s and radial velocity measurements. Although far from perfect the ‘characteristic age’ model is currently the best method to estimate pulsar characteristics based on spin period and period derivative measurements. Results and analysis suggest that spin periods are key determinants in the magnitudes of magnetic fields and energy generation rates of pulsars. From the analysis it’s suggested that faster spinning pulsars lose energy more quickly than slower spinning pulsars in agreement with calculations and literature. The observed proportionality between spin period and period derivative although requiring additional analysis was supported by the existence of millisecond pulsars and characteristics of the general pulsar population. We also excluded purely on age and calculated characteristics of magnetic field that PSR B1509-58 was once a magnetar. Lastly an attempt was made to categorise and place both PSR B0540-69 and PSR B1509-58 on a pulsar period derivate versus pulsar period diagram so as to compare and contrast their characteristics across a larger pulsar population sample. 1 ‘Period derivative’ is deemed the rate a which the period of a pulsar changes (‘first period derivative’ is also a term used) and is unit-less (sec sec-1). 2 SNR – Supernovae Remnant. This is the remnant of the supernova explosion which typically extends to a distance light years away from the source explosion (see front cover). 3 Given the limitations imposed by the choice of operating system hence Cygwin choice, many tools listed were compiled directly from source code. 4 Discrete Fourier Transform hereafter is abbreviated to ‘DFT’. 5 Conventional DFT’s (DFT’s O(N^2)) can typically be implemented using simultaneous linear equations or correlation methods. 6 A transformation is defined as taking multiple inputs, performing an operation on these inputs based on a set of rules, and producing multiple outputs (many in, many out). 7 Aliasing causes reflection of high and low frequencies in the corresponding low and high frequency spectral regions computed in the FFT resulting in distortion of the sampled signal, hence causing a pulsar signal not be properly reconstructed from the sampled signal. 8 ‘Overtone’ is used in this instance, however the term implies additional sinusoidal frequencies which are not necessarily multiples of the fundamental frequency (unlike harmonics) – in the sawtooth example ‘harmonic’ is an appropriate description also, as well as for pulsar analysis. 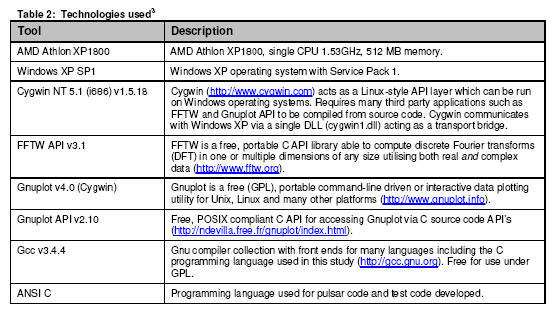 9 Software limitations with Cygwin were encountered with small sampling periods (below 0.007 seconds) and large RXTE data sets. To mitigate this initially, some large pulsar data sets were reduced however the sampling periods were ultimately increased to avoid stack overflow issues caused by large arrays required for data folding eliminating the need to reduce pulsar data sets. The latter approach did not affect results as the corresponding Nyquist rates shown in table 5 (in bold italic) were still well above the Nyquist rate of each individual pulsar. A sampling period of 0.008 seconds was ultimately used in our code for both PSR B0540-69 and PSR B1509-58 to reduce computational time for all data sets. 10 The choice of observation was in the end arbitrary as the average values of all observations or other individual observations used in the age calculations did not adversely affect the age of the pulsar in calculated and shown in table 8.